Growing up in the tiny, rural town of my childhood was an experience completely unlike any that I know of today. It was two parts Mayberry and one part Peyton Place. It was a place where children had the freedom to roam around town without parents having to worry. It was a time well before the Internet or satellite television. We largely made our own fun and we most definitely made time for social occasions. Some of the most important social occasions, other than weddings, in my little hometown were showers. Wedding showers and baby showers. They were huge events and it was not unusual for several hundred people to be included on the guest list for either. Each occasion required printed invitations which were hand addressed by the hostesses and mailed in sufficient time to allow for everyone to clear her calendar for the big day. Gifts were purchased and arrived at the shower accompanied by the engraved calling card of the giver. Yes, these were very special occasions. When the date for the big event arrived all the guests and the honoree gathered and enjoyed an afternoon of visiting and catching up on the latest news (i.e., gossip). The venue was always beautifully decorated with white linen draped tables and lovely floral arrangements. There was, of course, the ever present punch bowl with its matching tiny punch cups. And silver serving trays held delicacies of all kinds – fruits, vegetables with dips, and charming little Tea Sandwiches. Making the sandwiches for this post took me right back to those times when we planned special events months in advance, hand addressed correspondence and put on our Sunday best to show how much we cared for those with whom we shared our lives. I have three little tea sandwiches to share with you. The first one is a very traditional cucumber and butter sandwich. Another is a roast beef with horseradish and watercress and the third is definitely not traditional with its cornbread muffin and ham. For the cucumber-butter sandwiches, mix softened butter, grated lemon zest and chopped fresh dill. Spread onto thin white sandwich bread. Top with thinly sliced cucumber. Trim the crusts and cut into pieces. For the roast beef and horseradish version, mix sour cream, mayonnaise, horseradish, salt and pepper. Spread on whole wheat or rye bread. Top with thinly sliced roast beef, thinly sliced tomato and watercress. Trim the crusts and cut into pieces. For the ham and cornbread sandwiches, mix butter, chopped scallions and honey. Spread on split mini corn muffins. Fill with thinly sliced ham and hot pepper jelly. Spread a split baguette with softened butter. Top with smoked turkey, cheddar cheese and sliced apple. Slice thinly. Spread soft cream cheese onto slices of date-nut or other fruit bread. Sandwich with sliced strawberries. Cut into pieces. Chicken salad makes a lovely presentation when served in tiny puff pastry rounds. Cut the rounds with a 1 1/2 to 2- inch cutter. Fill with your favorite chicken salad recipe. Pimiento cheese is always popular in the South. Use my traditional pimiento cheese recipe on marbled rye. Slice into pieces and top with a tiny slice of pickled okra. –Note: some ideas were adapted from Food Network magazine, May 2011 edition. Three tea sandwiches perfect for any special occasion. Mix the butter, lemon zest and dill. Spread on bread and top with cucumber slices. Trim crusts and cut into serving size pieces. Combine the mayonnaise, sour cream, horseradish, salt and pepper. Top with roast beef, tomato slices, and watercress. Mix the softened butter, scallions and honey. Spread a small amount on the bottom of each split corn muffin. Top with ham and red pepper jelly. Replace the top. 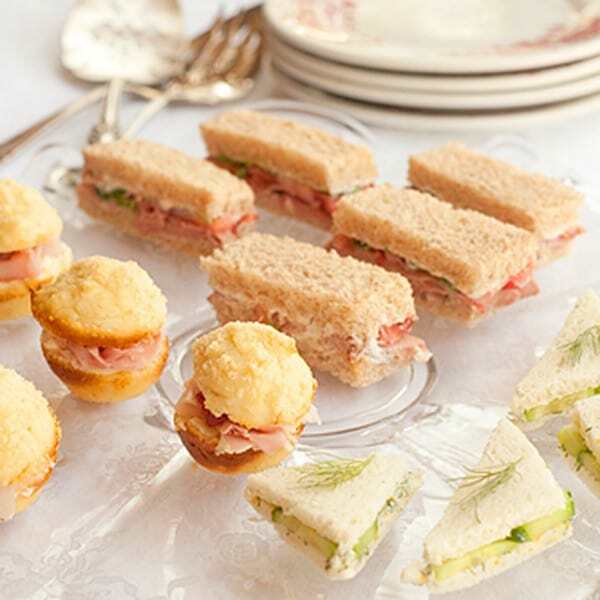 Lots of great ideas for finger sandwiches from Southern Living Magazine. Those ham cornbread ones are calling MY name! Yum! Those are my favorites, too, Marnely. That little dollop of hot pepper jelly really makes them great. Or you could use a slice of pickled jalapeno as well. Perfect for a wedding reception! And I have just the place for them. Thanks! Those look great. Did you have a little party? Are there any leftovers? These are so cute! I love afternoon tea and finger sandwiches. I think I’ll have to try the ham cornbread variety. Hope you enjoy those, Shirley. We did. These are so cute!!! Just love them. Thanks, Katherine! They’re also lots of fun to make! Love the idea of using mini corn muffins!